We are looking for new colours and textures to add to your salads, but of course with bolt-resistance and good flavour as well. Land Cress makes an interesting all year round addition to your salads. Anyways, on to the lettuces! We've listed them by the types of head they make. Sow short rows often, to keep a good supply through the season, and not be overwhelmed. If you end up with too many, make lettuce soup! Stem lettuce - a.k.a. 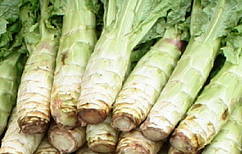 celtuce or asparagus lettuce - is grown for its tall stem which is eaten cooked like asparagus. This special variety from China has deep purple pointy leaves that are really pretty. The fat stalks are cut into strips & used in stir-fries.Sow in autumn under cover; it doesn't like heat. A really showy red variety of iceberg lettuce. It has tight round heads wrapped in deep red leaves. Inside the head is bright green and so you get two colours for the price of one. It stands well for a long time - making big tight heads quickly, and is nice and sweet, with good tolerance of cold and wet conditions. This fantastic lettuce has dark green, crisp iceberg leaves forming a loose rosette, with spiky, toothed edges. It is very resistant to disease and cold weather. Does well sown in spring/summer but also good for use as a winter lettuce, as it is tolerant of lower light levels. This has been hugely popular since we first added it to the list. The name means 'Queen of the Ices' and it is a fantastic crisphead lettuce - green tightly wrapped crisp iceberg heads, with incredibly frilly & toothed leaves around them. This one has been a real attention getter in the garden every summer. Actually about 200 years old, this strain has recently been reselected for home gardeners, and the seed we have is really vigorous. Here in the picture it is being modelled by our neighbour Mika. It has had fantastic feedback from all over the country, everyone seems to want it in increasing numbers every year. It doesn't produce a massive amount of seed, so we've had to give slightly smaller packets - but 150 seed should give you a very good crop of lettuce, especially if you start them in trays or modules. Save your own seed for next year using the instructions supplied! Toothed iceberg, incredible, fantastic lettuce. 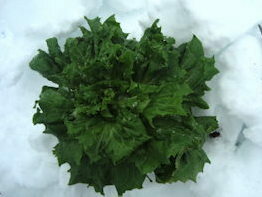 Can also be grown as a Winter Lettuce, the picture here shows it unearthed from the snow where it was growing high in the Pyrenees. An amazing lettuce that is rarely available. This has large rosettes of long pointy leaves, & it is such a dark red that it appears almost black in the early morning light. Red Deer Tongue is a traditional variety, and this special strain has been recently re-bred and reselected for really super-dark leaves. It is an incredible sight in the garden or the salad bowl - try growing it next to a bright yellow one or green one for a stunning contrast. A very large open-headed lettuce, with bright, bright green-yellow leaves that are gently frilled. Good flavour and crunchy texture. Very decorative, and slow to bolt. It makes huge lettuces – you only need three or four to keep you in salads for ages. This is still Ben's favourite. We've had lots of really nice feedback from people on this one, including one person who was very happy but said we need to stress the size of it more - it outgrew their 40" wide raised bed despite being beheaded several times! Actually, ours don't usually get that big, but then we do eat a lot of salad . 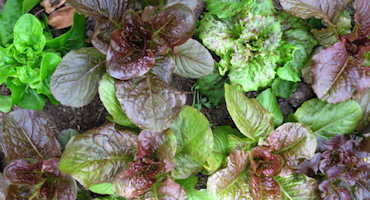 . .
A first-early, cool-weather oakleaf lettuce which grows quickly from an early spring sowing. Semi-heading, it quickly makes small loose green ruffled heads that are tasty & crunchy, the right size for 1 or 2 people. A good variety for the start of the season : sow several times in succession until the weather warms up. 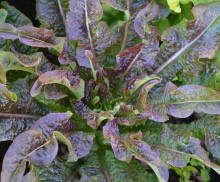 This pretty lettuce is a big, vigorous oakleaf type, with fantastic markings - the large pale green leaves are patched all over with dark red splashes. It is ideal for picking a few leaves at a time, for attractive and tasty salads. One that we always include in our own sowings for the kitchen. Absolutely stunning - and tastes great too. This is a quick and large glowing green lettuce, with rounded leaves. If you don't know the term, 'Butterhead' is the name given to lettuces are ones with softer, not-so-crunchy leaves, and they are really nice to add a different texture to your salads. Optima is a special find. It has a good butterhead leaves, but unusually for this type, also has really crunchy leaf ribs, so a single leaf provides this amazing contrast of textures in your salad. It was a complete star in our 2008 trials - growing really well despite the cold and wet. A very pretty butterhead (tender leaf type) from the 1800's. Loose heads of pale green leaves, washed with two shades of bronze and red. George Admire was born in 1822, and his lettuce was kept going by the family until 1977 when his last relative, 90yr-old Cloe Lowry, gave some to a seed-saving organisation. Slow to bolt, tender even in heat – with rave reviews from everyone. so you can take leaves off a few at a time as you need them. Here is a great new, large, upright lettuce with glowing red/purple oval leaves. It was very quick to develop, as well as beautiful, in our 2008 trials, and attracted a lot of attention from visitors. We liked it because it stood well without bolting, and didn't get bitter in the heat. This is one of the few lettuces that has both white and brown seeds, so dont panic when you see them mixed in the packet! Modelled here by Paul M.
For those of you who want something new and exciting, we are offering this very mixed selection of lettuces. This contains seed from all of Frank & Karen's current lettuce breeding programmes. A huge diversity of forms and shapes, and to be clear this is NOT just all our seed mixed up, but different varieties you won't get elsewhere. Its a secret because much of this great seed has yet to be named or released; but you can try it now in this special mix, years before anyone else can grow it. In 2014 & 2015 we added even more varieties to the original mixture, to extend the range of colours and types even further. This is incredibly popular, and quite rightly so - its a real bargain. Reds, greens, brights, darks, splashes, blushes, crisps, butters, leafs, heads, and tongues. Some varieties soon to be famous? You might be among the first to find out. What's this you ask? 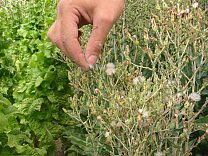 Winter lettuce are simply very-cold-hardy strains, selected for sowing after mid-summer, for harvest in autumn - and with a bit of protection, on into winter. Ideal if you have a polytunnel and want winter salads. We have been trying out all sorts of different ways of getting more salads overwinter, and this lettuce always does very well. It is a traditional French variety chosen specifically for sowing in late summer and early autumn. It is quite hardy and will do very nicely in an unheated polytunnel or greenhouse, providing salads in winter and spring when theyre most appreciated. It is remarkably cold-resistant and carried on in the polytunnel long after other varieties had given up! Photo taken 28th February in an unheated polytunnel in Wales. Lettuce Winter Marvel this is now growing like the clappers in my coldhouse. We are picking lots of leaves once a week - in November. Tristan. 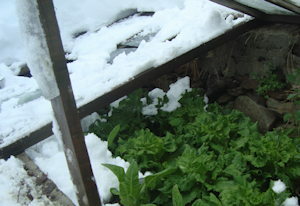 These lettuce, which are the ones in the snowy photo, are already listed above in the normal lettuce section, are excellent winter lettuce, very cold resistant, as well as being suited to sowing at other times of year. Here is volunteer Stephanie picking some seed from the Australian Yellowleaf. Alternatively, on the right, you can see Ben has cut whole heads from the plants and let them dry, and is then stomping on them to knock the seeds out.